The ESCOs in the Duquesne (Pittsburgh) region also offer another option when switching electricity - choosing if a customer wants a certain percentage his or her electricity to be generated via renewable sources (most use wind and/or solar). Here I have graphed another time series (Oct 2010 - Jul 2013), this time comparing the average rates of plans that have renewable generation. Plans offered in the Duquesne region offer 2%, 12%, 20%, 50%, and 100% renewable options. Observations: 1 - On average, renewable plans through ESCOs are competitive to Duquesne's price to compare (PTC). While the 100% Renewable plan was initially higher than the PTC, it stayed consistently lower for over a year (Apr 2012 - May 2013). 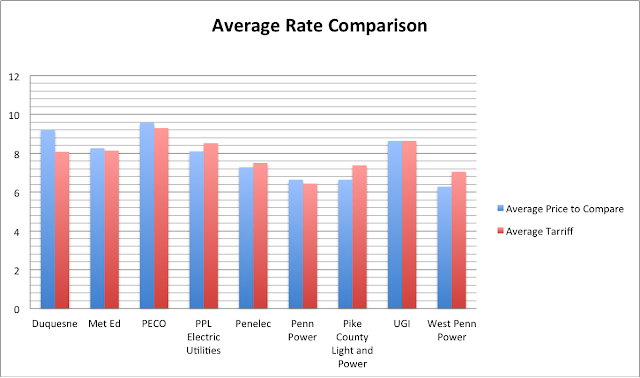 While neighboring Pennsylvania saw explosive growth when retail customers were first able to purchase electricity from competitive suppliers, customers in Maryland have switched to alternative suppliers at a much slower rote. Only 3% of residential customers had actually switched to a new supplier as of 2009, a paltry figure when compared to the near half of customers switching in Pennsylvania. Late 2011 and 2012 began a dramatic upswing in residential electricity purchasing in Maryland however, with over 22% of customers having switched by mid-2012 (http://esm.versar.com/pprp/factbook/01MD_Power_Industry.htm). The direct cause behind this growth isn’t easy to pinpoint but great awareness of the availability of third party power providers probably played a major role in growth over the period. Indiana lawmakers recently commissioned a report to be delivered no later than November 2013 to assess the potential benefits of moving to competitively supplied electricity. This study follows on the heals of increasing pressure to consider some form of modified or deregulated market for the state’s consumers. In a recent interview former FERC Commissioner Bill Massey stated that deregulated markets have delivered average costs that are 11.8% lower than their conventionally regulated counterparts. These savings are particularly valuable to local businesses and energy-intensive industries looking to streamline costs. While not all are sold on the merits of deregulation, Indiana lawmakers believe that the possibility at least deserves further consideration (http://www.midwestenergynews.com/2013/05/14/michigan-indiana-warm-to-the-idea-of-expanding-consumer-utility-choice/).